THE government has announced a set of incentives for business that are aimed at getting the wheels of the economy moving. Whether or not these steps help in achieving that objective is now the big question. 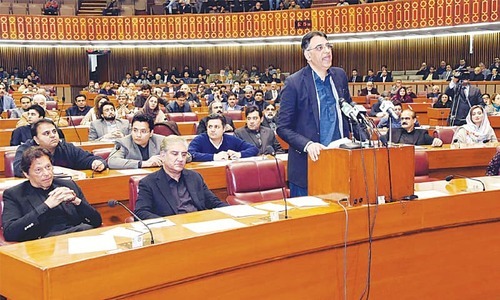 The speech by finance minister Asad Umar focused on the politics his party faces, as well as the incentives the government is offering to the business community in the hope that with more money placed at their disposal, investment will receive a boost. 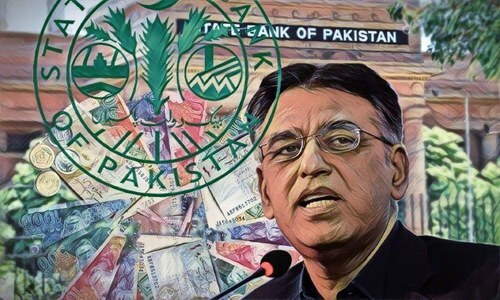 The minister was correct to point out that Pakistan’s saving rate is far too low to support elevated investment, and growth in the face of a low savings rate is likely to prove self defeating. It seems the measures tabled in the supplementary finance bill are trying to encourage investment and discourage the import of luxury items. All bets, it seems, are now on getting growth started. The speech gave nothing away on how it will be paid for, so either there are tax bombshells hiding in the taxation details to be revealed later, or there is an ardent hope that revival in business activity alone will lead to higher revenues. The minister gave no indication of the revenue impact of all the incentives he announced, but given their sprawling scale — from customs duties to sales tax to income tax — it is likely to be substantial. Also, in some cases like reduction in tax on inter-corporate dividends or elimination of the super tax on non-banking corporates after July 1, it is difficult to see why these merited such urgent treatment at this time. One thinks of a mid-year mini budget as a course correction in response to immediate pressures. Large agenda-setting changes, particularly if they are to be made effective from July 1, did not need to be accommodated in a mid-year supplementary bill. It appears that the measures and the bill have been designed to put a smile on the face of the business community. Such an exercise carries great costs in terms of revenue foregone. Whether or not it spurs economic growth is entirely another matter. If there are indeed measures designed to offset the revenue impact of all the incentives, then we can be certain that big surprises lurk in the details. But if there are no surprises, and everything has been revealed, then the government has placed an outsize bet that stirring business sentiments will lead to a revival of growth. And once the dust from this mini-budget session settles, the larger questions facing the government about structural reform and plugging the growing revenue shortfall will still be there. In that sense, it is now an open bet as to which will speak louder with the passage of time: the words of the finance minister or the silent gaps in the speech? How can Imran Khan activate his social policies without a large budget? He could not. Please learn to appreciate something good. If these guys stop making efforts, we will be back with the thugs. This article does not give much in terms of analysis. Apparently it appears good initiative on the part of the government. Hopefully it will start running the wheel of economy. Previously there was discouragement on savings. If savings were made, it eroded the value of money because the profit on investment was not matching the inflation. The government needs to bring stability and restore the investment climate in the country. It will take time but can be achieved through persistent efforts and periodical revisiting impacts of recent measures. It is further required to restrain and control government expenses and plug the holes from where the public money is draining out. Be strict and stand principled on policy of "do not do corruption and do not allow corruption" This is the most important for viability of the country. Tax cuts most of the time cause capital growth and if there is good oversight it will revive the growth needed for the Pakistan economy. PM Imran and Asad Umar must send thier approvals to the concerned ministeries for implementation of the decisions taken with regards to tax relief and incentives for the business community. There should be a follow up . I hope and pray new industries will be set up to bring employment and increase our exports. Shortfall of 6 billion or so due to tax relief and incentive for businesses will prove to be an insignificant amount once the industries and businesses start getting back on their feet. It has reached the point of becoming humorous the attempt by author to criticize the mini budget without putting any meaningful & in-depth analysis. I believe that the media team of PTI failed when a hype was created that a mini budget from PTI Government is going to create a havoc. Opposition made full use of it. However, after the the presentation of the mini budget there is a sigh of relief everywhere. Appreciated. Either writer is in disbelief or his newspaper did not allow him to support this positive mini Budget in public. They want to encourage savings but continue to charge WHT on banking transactions by non filers. Previously property was the highly used channel for investment. It's a big shift to make and earn from exports. Reducing taxes will reduce revenue but we have to see advantages in the larger picture of how these incentives will boost the economy and create opportunities. Very well written. Maturity is more important than emotions. I am no economist but even I could feel refreshed by reading the proposals. Of course there can be some shortfalls but overall feels like we are heading in the right direction. Imran Khan is fighting for Pakistan whereas the ogher two are fighting to save their ill begotten wealth. I thought we needed more direct taxes and less indirect taxes so the masses would benefit so they would have more money to spare and then they would spend that extra money which would also boost the economy and not only benefit the rich. Nothing about stopping smuggling, nothing about stopping corruption (which they said was 12 billion rupees per day in the previous government), nothing about bringing back looted money, instead no questions to be asked if you have money in foreign banks. As usual, a 100% U-turn! Now I started to believe the government is really restructuring economy. Omens good for the country. Answer to your question is more the business more the Tax collection, i will be an overall impact. Speech was too long and unnecesarily critical of opposition. Running country like a urea factory can not bring the prosperity,increase in prices then give subsidy . The real problem faced by Pakistan is too few direct tax payers. Changing status and tax of Filers and Non Filers will not solve the problem as this game is being played for years with no improvement at all. What is required is to understand why people in general are not getting into the tax net and resolve those issues so that voluntarily people file tax returns and pay taxes as is in other countries. I do not think this issue has been addressed by this budget at all. Unless we do this we will keep on playing games with no real solutions. So long speech and so little outcome! How mini budget will help common people? Not clear! IK and his naïve & inexperianced comrades do not know an iota about the suffering of common people in country from Peshawar to Karachi. In Karachi's posh areas there are serious water and gas supply issues! In not well to do areas of Karachi for example, in Orangi town people do not get electricity and Sui gas on daily basis, so they cannot cook their meals, hence families go on skipping meals and suffer from starvation for days...in areas like Surjani town, people do not get electricity and water for weeks and hence they cannot send their kids to schools for many days...the story goes on and on! Does anyone care for common people! Hats off for PM Imran Khan and his team. This budget is excellent and truly speaking people were not expecting much this time. @Talha Ejaz, ---- Tax cuts cause money capital growth which is invested in the New York and London stock markets. This broken and looted house will at least take a decade to make it right. Give these folks a break. They are working hard. The crux is a high savings rate. China's savings rate has been more than 40% for years. India considers a savings rate below 30% to be poor. saving to gdp ratio of Pakistan is now at 6.8%....India is at 29.85, Bangladesh at 25.3%, South Asian average is 27.1%. Unless you address this, your GDP growth is not going to pick up. With borrowed funds you will gallop for a while and then fall back....each fall hurting you so much so that , to get up and get going again is going to be ever more difficult. I assume the government has taken all the necessary measures to evaluate the pros and cons before taking the decisions, else Pakistan is headed for a major economic disaster. A correct analysis of mini budget changes which by & large, is a gamble with high stakes played out by the govt. to lure local businesses to invest more into revival of stagnant commercial activities & ease up jittery financial market. It is correct to say that without details forthcoming, true & in-depth analysis of proposed steps which by and large indicate circumventing existing sources of revenue, is not possible at this stage. Nevertheless its impact on growth of economy envisaged whether positive or negative will be known soon by reactions reverberating from financial indicators in play.